Developer: Creatures Inc., HAL Laboratory, Inc., Nintendo Co., Ltd.
Pokémon Stadium, known as Pocket Monsters Stadium 2 (ポケモンスタジアム2, Pokemon Sutajiamu Tsū) in Japan, is an RPG-styled strategy game developed by Nintendo EAD with the assistance of Creatures and HAL Laboratory and published by Nintendo for the Nintendo 64 video game console. It was released on April 30, 1999 in Japan, February 29, 2000 in North America, and April 7, 2000 in Europe. 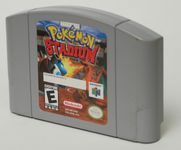 Though known in Western regions as Pokémon Stadium, the game itself is a sequel to a Japan-exclusive title released in 1998. Source: Wikipedia, "Pokémon Stadium", available under the CC-BY-SA License.